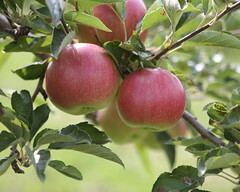 I just love going to the apple farm, because besides apples, they have so many other things to see, smell, and taste! There’s the rows of corn stalks lined up like a marching band along the children’s corn maze, keeping the little ones continually guessing how they’re going to find their way out. There’s crate after crate of colorful pumpkins, guards, and squash, and I think the bunches of Indian corn must have every color imaginable, because they aren’t just brown & red anymore! And I mustn’t forget the luscious aromas that escape out of the big red barn, and somehow find their way right to our little noses! The scents of popcorn, cotton candy, apple cider, chocolate fudge, fresh baked donuts, and caramel apples all seem to mingle together and scream come & find me… and of course we must! 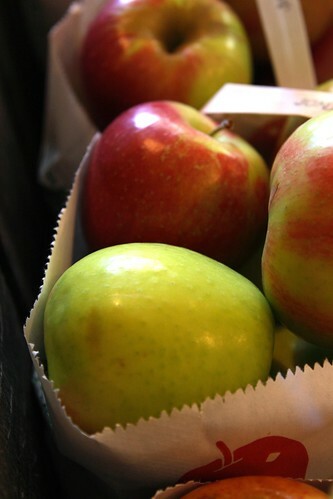 Even though I know what “type” of apple that I like the best, when we get to the farm, we still have to ask the same question every year – which is the best kind of apple for eating, and which is the best for baking? Since I ask this question every year, I thought you might face the same questions when you get to the store, apple orchard, or farm stand in your area. So… I wanted to put together a little list of the different kinds of apples, their descriptions, and what they might be best suited for. The Forest is in Bloom! 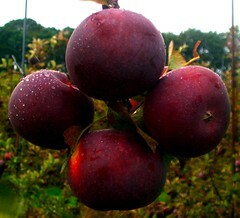 Mmmm… this makes me hungry for some juicy, sweet apples! We don’t get apples like those here in Texas! Thank you for sharing, what lovely apple stories, and beautiful photos, and the bit of education, too. 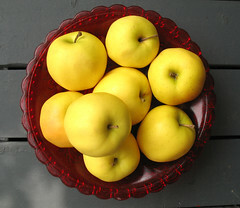 I always forget which apple is best for the pie and have to ask each season. Thanks for the tips. 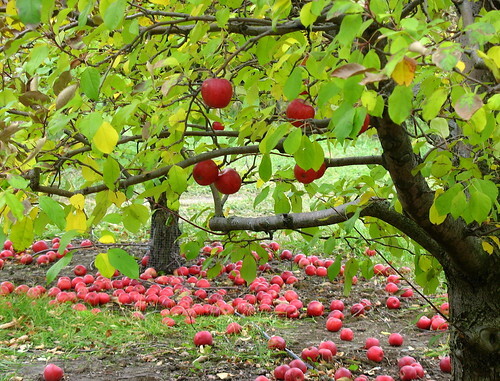 Carrie – Our property used to be an apple orchard. We’ve heard stories about how the town Fathers would come up to the old farmhouse (still on the property – we’re going to fix it up and make it available to another family to rent), go down into the basement, and make “many – a – decision” over a cup of hard cider. What a wonderful story~ Do post pics when the old farm house is being renovated. What a fabulous post. I love how sensory you made it for us. And thanks for the descriptions of the apples – what a help! I had no idea some were better for baking than for eating. Oh what a fun post! 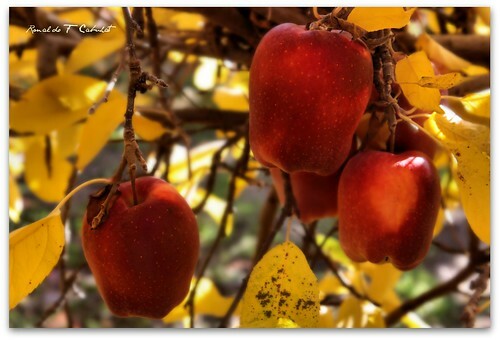 Do you know that I have never seen an apple on a tree? I loved reading about all of the different varieties! You are such a gracious and warm person Pearl to share this wonderful life and beautiful Orchards . 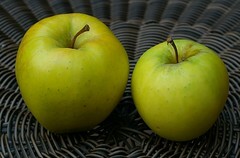 Just loved your fantastic post on apples , the pics and the description was a real treat. Thank you for all the time you took in describing what apple is good for what. It will be great to have this info on hand. What a great post! I love the story and I love the pic’s. 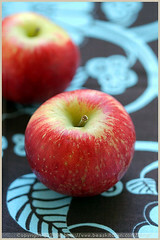 Thanks for the lesson on apples too…nice for reference. Finally here to check on what was done with my photo (the Northern Spy apple). What a beautiful collection you’ve put together! I am extra happy because this weekend I found out that the only organic apple farm within a 75-mile radius has just started Northern Spys. Yeah!! What a treat! 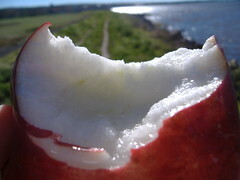 Your apple narriton is just beautiful. 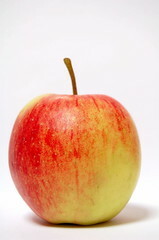 I love all apples, and the Empire is just beautiful. But Jonagold and Winesaps get my vote. Thanks for sharing your wonderful trip. I look forward to a trip to the local orchard every year. What a wonderful post. Very clear and informative. 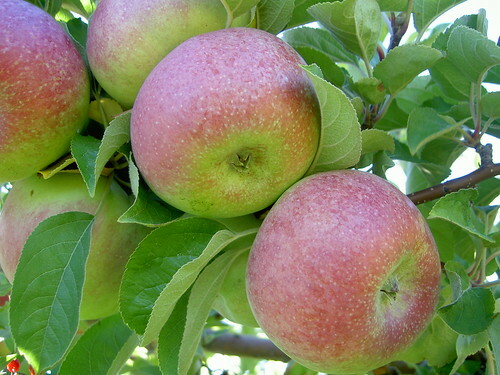 A wonderful guide to the apples of the season. Thank you! Hey, this apple guide is really helpful. I never know what kind of apples to buy for baking! I’m suddenly hungry for a juicy apple! What a beautiful post. Wow, I could just jump into the picture with the trees so full.. and all of the windfalls! 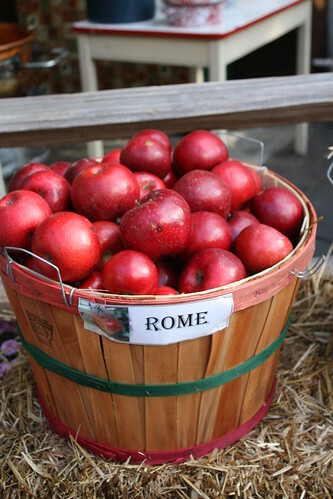 I’m just itching to do some baking now..
My family and I went to an apple festival at a historic farm recently. I’ve never seen so many varieties before. 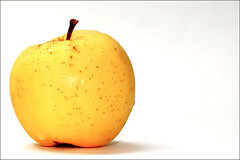 You and I love the same apple.. Jonagold is my numero uno as well, perfect!